Today I have two great drink recipes to share with you. Enjoy! The first recipe is non-alcoholic and has been a popular summer tradition in Massachusetts since the early 1900s. The first time I had this drink was in Cape Cod many years ago, and now it is a yearly tradition for us on the Cape! You can make it with almost any type of berry and it would taste just as wonderful! My second recipe today is an alcoholic drink, called a Mojito! The Mojito is known as the national drink of Cuba. Many people say it was invented in the late 19th century but, it actually may date back to an even earlier origin. 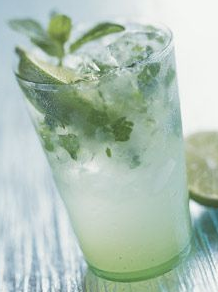 It has been said that “pirates” of old, may have concocted drinks similar to the mojito, perhaps in the 16th century. The earliest mojito may have been a combination of a rum variant, aguardiente (fire water), and that these pirates of old introduced the drink to Cuba. 1.) Stir together 1 1/4 cups lemon juice, the orange juice and 3/4 cup simple syrup. in a small bowl. Set aside. 2.) In another bowl, stir together the blackberry juice, 1 tsp. lemon juice and 2 Tbs. simple syrup. Set aside. 3.) Put the ice cubes in a blender and add the lemon juice mixture. 4.) Using the crush setting, (or high speed), blend until smooth. 5.) Put 1 Tbs of the blackberry puree into each glass. 6.) Pour in the lemonade mixture, dividing evenly. 7.) 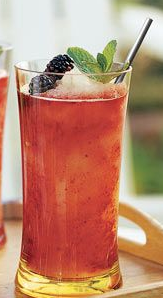 Garnish each glass with a mint sprig and a few blackberries. 1.) Place the mint leaves in the bottom of the highball glasses. 2.) Add the simple syrup and lime juice and mix well. 3.) Fill the glasses with crushed ice. 4.) Add the rum and club soda and stir. 5.) Garnish with the lime wedge. 1.) In a small saucepan over medium-high heat, bring water to a simmer. 2.) Add the sugar and stir until it completely dissolves. 3.) Remove the pan from heat and set aside to cool to room temperature. 4.) Pour the syrup into a pint sized container and seal. 5.) Refrigerate until ready to use. These sound nice for the summertime...well, actually anytime! I am an ice tea fanatic, so this recipe will give me a change! WOW.THANK YOU FOR SHARING THIS NICOLE. I'll make it today,i bought so many blackberries this weekend. i love mojitos ... for added flavor substitute bacardi razz & a couple of fresh raspberries floating around! makes me think of vacations spent lying by the pool ... ! Nicole, That blackberry lemonade looks delicious! Perfect for a hot day like today. off to make these this eve, Mojito is a soltice delight! thanks for sharing.